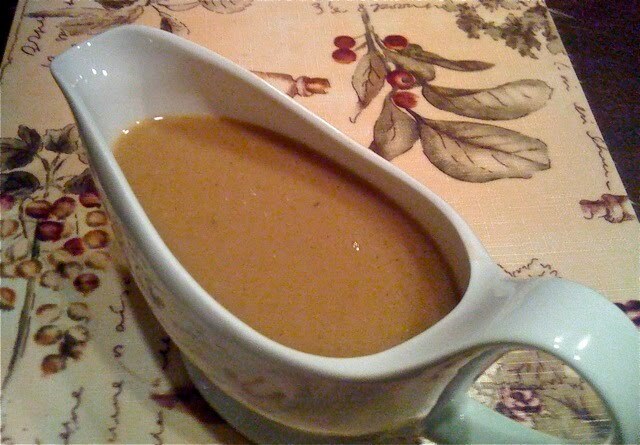 You might want to bookmark this little tidbit for next year’s Thanksgiving, because it was the finest turkey gravy I’ve ever made. This is yet another proof of how a little bit of playing with your food can take you someplace special. The turkey had been stuffed with onions, sage, orange, celery, thyme, and garlic. It had been brined and dried before roasting. One and one half hours before end of cooking, I poured .5 can Coca-Cola over bird. *You’re think crazy thoughts now. I know. Coke? WTF?! This is the only time per year that I have a coke. Hey, it helps make amazing gravy. After I pour half the can, I take a sip from the rest and remind myself how horrible this stuff is! Once all the juices are strained, allow them to sit so that the fat can rise to the top. This will happen fairly quickly. Remove all fat, reserving 4 tablespoons in a small pan. Now, for the roasting pan: Remove all big bits of leftover skin and gristle. Place over medium heat, and scrape until leftover brown bits melt into the liquid, and the sharp alcohol flavor cooks off. Strain, and add to pan juices. You’re going to make a roux out of the previously reserved turkey fat, and 4 tablespoons flour. Whisk the fat and flour over medium-high heat for 5-7 minutes. The longer you go, the deeper flavor you’ll be rewarded with. Just don’t let it burn. Slowly whisk the pan juices into the roux. Continue to whisk for two minutes once all pan juice is added. If you’re into that kind of thing, you can strain again before serving. I didn’t. It was only a matter of time before I did this. I love bacon. Love it with all my heart. So why not make my own, right? I did. It was a time intensive process, but the actual work time was very limited. The result was decent, but too salty. Don’t try this at home (yet). Actually, do try this at home. Make some adjustments to the recipe, and let me know how it turns out. Washed and patted dry pork belly. Left pork in celery juice for 48 hours, turning occasionally. Removed pork from juice, rinsed, and patted dry. Turned it every day, draining excess liquid. After one week, rinsed and dried pork. Smoked, over very low heat, for 6 hours. 1) This, unlike making yogurt, is worth the effort. Making bacon at home is damn satisfying. 2) For next time: reduce salt by at least 1/4 cup, and increase sugar by 1/4 cup. 3) Leave more liquid in curing bag? I think if I hadn’t drained the bag so much, the pork belly might have reabsorbed some of the liquid, decreasing the salt concentration in the meat. 4) There is only one smell better than having your apartment (and neighborhood) smell like sweet smoking wood for 6 hours–it’s having your apartment (and neighborhood) smell like sweet smoking wood for 6 hours, and then having your apartment smell like bacon for 2 hours after that. 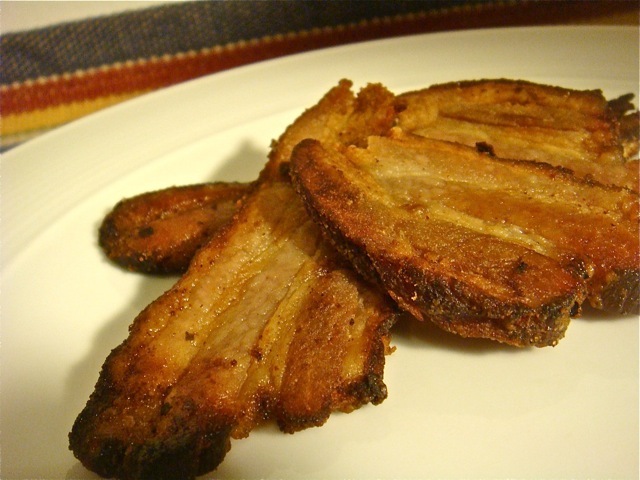 *Uncured pork belly can be hard to find. Your best best is to seek out a neighborhood butcher and ask. If they don’t carry it, they can usually order it for you. *Celery juice? Really? Yup. Celery contains natural nitrates which will help cure the meat. I also like the subtle flavor it adds. If you want to skip this step, you’re going to have to order something called Insta Cure #1- pink curing salt. 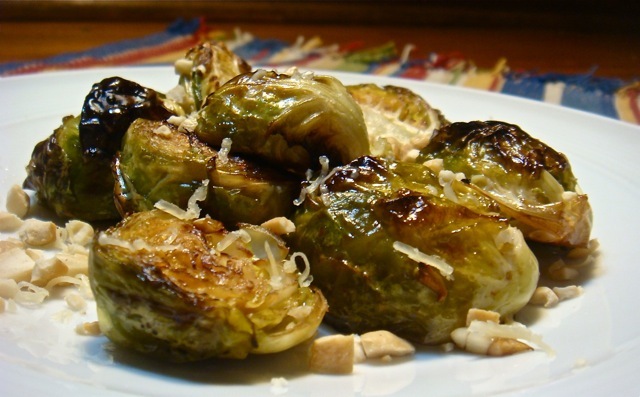 First things first- my momma actually makes some pretty terrific brussels sprouts. But most people don’t. They’re often boiled to death, or, even worse, microwaved- I actually saw a bunch of tired looking sprouts packaged with the instruction “simply cover with plastic and microwave for 5 minutes”. Well, no wonder these little things get such a bad name! 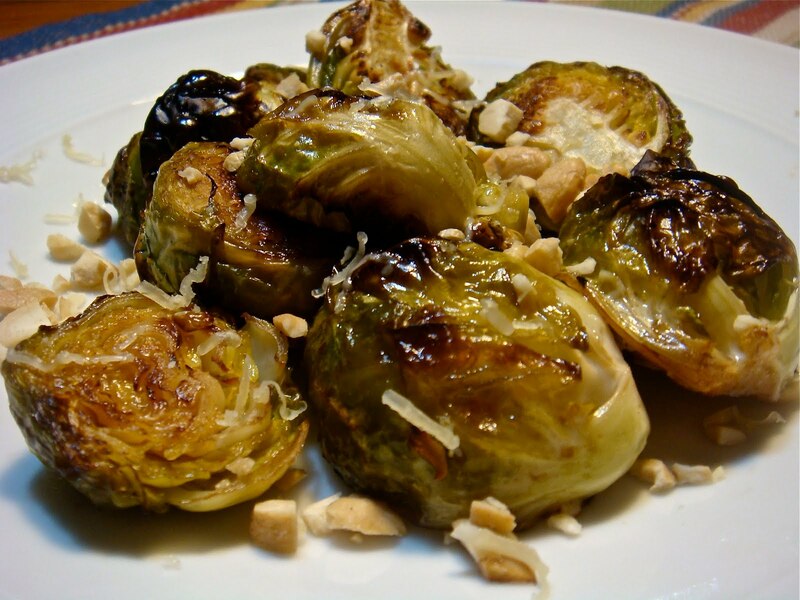 Let’s change that, because brussels sprouts are very tasty, and full of healthy vitamins and minerals. Place on a roasting pan, cut side down, in a pre-heated 400 degree oven. Place back on pan, and back into oven. *Feel free to use whatever cheese you like for the topping, or no cheese at all. Sharing is caring indeed. Here are a few outstanding taste-makers I met last weekend at the Foodbuzz blogger festival. Hog Island Oyster Company: Read my last post? It’s pretty clear why I love these guys. Hearst Ranch Beef: Went to a fascinating farm-to-table discussion with Brian Kenny from Hearst Ranch Beef, and Chef Paul Arenstam from the Americano restaurant. Kenny is totally on the ball, really pushing the conversation forward- by resorting to a traditional way of raising beef. Hearst Ranch beef are free roaming, grass fed & finished cows. Hearst’s operation is growing step by step- Kenny started by selling directly to progressive chefs like Arenstam, and has now taken the bold move to convince convention centers to buy better beef. Very clever, Mr. Kenny. Consumers can order directly online. Next time you’re in San Francisco, stop by the Americano for one of Chef Arenstam’s Hearst Ranch beef creations- the meatballs are outstanding! Frog Hollow Farm: Located in Brentwood CA, Frog Hollow Farm is justly famous for its legendary fruit. They’ve been farming organically for 20 years, making them leaders in the fields. Want to know how committed to flavor they are? Well, Frog Hollow Farm is one of just two commercial operations in the United States to grow the warren pear. It’s a temperamental thing to grow, so most don’t. It’s also, hands down, the best pear I’ve ever had- soft, buttery, complex, sweet, and just delightful. Also recommended- the dried fruit. “Better than candy” doesn’t even begin to do the dried peaches justice. Find them if you’re in the Bay Area, especially during summer and autumn- and order online if you want some amazing dried fruit for the holidays! The Ball Whisk: I love this whisk. It has an innovative design- long, straight wires with a heavy ball of plastic at the end, and a shorter, heavier wire in the middle. It’s 3432423532 times easier to clean than the traditional whisk, and is more effective, too. And it looks awesome. Notes on Cooking: Written by Lauren Braun Costello & Russell Reich. This little book of basic kitchen tips would make a terrific holiday gift. If you’re new to the kitchen, you’re going to learn a lot. Even if you’re experienced, there are tips & tricks in there for you. Just remember to ignore #35- “Banter Down”. Costello & Reich, probably due to too much time in professional kitchens, seem to think that the home kitchen should be a place of work and silence. Screw that- talk all you want- cooking should be fun. I ate a raw oyster. Actually, I ate fifteen of them. As many of you know, I grew up a really picky eater. Terribly picky. I didn’t even eat carrots until I was 24. Seriously. During the last few years, however, a marvelous thing has happened—I’ve started to enjoy foods that I had convinced myself I hated. 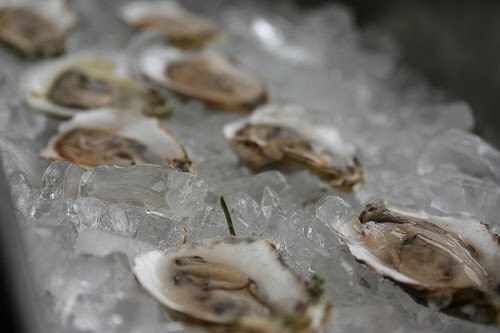 The oysters were from Hog Island Oyster Company, a sustainable oyster farm located about an hour north of San Francisco. They were kind enough to set up a stand at the first night’s event. I was feeling brave, and, with a dash of mignonette, sucked down a Hog Island sweetwater oyster. It was sweet and briny. Fresh. Mineral. Smooth. As soon as I swallowed the thing, I totally understood why oyster lovers are oyster lovers. There is a certain joy that envelops you when you eat an oyster. It’s hard to explain what that feeling is—if you’ve experienced it, you know what I’m talking about. If you haven’t, you ought to. After eating my first oyster, I walked away. I felt proud being such a brave dude, trying something new. “Great, I ate an oyster. Now on to the steak and cheese meat pie.” But a few minutes later, I was back at the oyster stand. One, two, three more oysters. I wanted that joy again. Four, five, six, seven. One with a little hot sauce. One with lemon. One just as it was. On and on. This is why I love food. I felt the joy all night long. Part of it was the magic of the oyster, and part of it was the joy at trying something new. When you taste something you’ve never imagined before, you’re going to be happier for it. I speak often of having courage in the kitchen when you’re trying something new. The courage translates well to food festivals, too. That happiness was still clearly evident the following morning. As I wandered through the Ferry Building farmers’ market, I found myself at the Hog Island stall. I told the fellas working the stall about my experience the night before. “I think we have convert,” the dude with the beard said as he shucked me another oyster. He sure does. Next time I’m in the Bay Area, I think I’m going to have to head up to Tomales Bay, and learn more about the process. Until then, I’ll be chasing the buzz you get when you eat your first oyster. *Check out Foodbuzz for quite a few recaps of the blogger festival, as well as a ton of other excellent content. Interviewed last night on Live! From the Future with Stuart Paap. 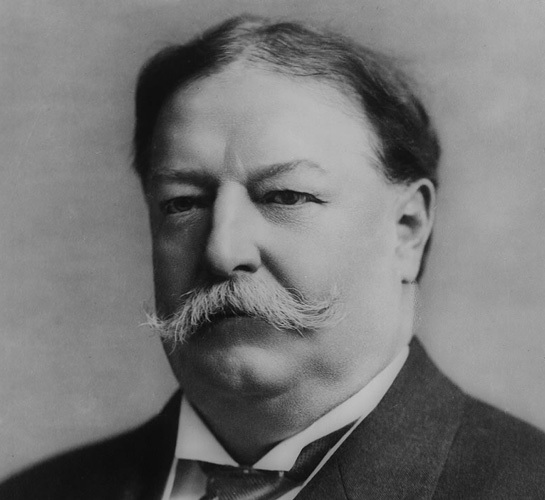 Showed the crew how to make a simple creamy pesto sauce, talked about some movies I’ve been in, and shocked the world with my brilliant knowledge of mustachioed United States Presidents. Watch the interview. I’m on about 30 minutes into the show. Special message for the dudes out there: If you needed more proof of why you should learn how to cook, check out IM Girl Jessie Schneiderman’s reaction to my killer pesto. I’m enamored with apples. They are amazing little things. Thousands of different apples exist in nature, as each apple seed will produce a unique variety. Although most of them are not great for eating, hundreds of them are. Sadly, much of the diversity has been lost to the ages, and, more recently, giant agriculture’s decision to bring just a few types to the MegaSuperMarket. Happily, I’m not the only person who is obsessed with apples, and a handful of good people have kept many heirloom apple trees producing tasty fruit. I recently spent 10 days in New York. It’s an apple state. So, naturally, I ate my way through the greenmarkets, one apple at a time. With one exception, I chose apple varieties that I was unfamiliar with. Golden Russett: The Golden Russet was grown as a cider apple. It has been grown in New York since before 1845. It’s a smallish apple that has a bronze-green, sandpaper textured skin. The apple’s flesh is fairly crisp, and very airy- reminiscent of an Asian pear. The flavor is soft, mellow, and sweet, with a faint cider-like taste. Winesap: Grown since 1817, the Winesap is one of the more popular heirloom apples on the east coast. It’s a medium sized apple, with a thick red skin that has speckles of green. I found the skin a little too thick for my taste, so enjoyed most of the apple with the skin peeled- seems like the thickness would make for a great baking apple. The flesh is very crisp & juicy, with a well rounded apple flavor. It tasted almost like drinking a great apple juice. Keepsake: The Keepsake is a medium sized brick-red apple, with mottled green undertones on its thin skin. It’s a crunchy, snappy apple. I found the flavor reminiscent of apples I ate growing up- sweet, earthy, and a hint of tartness. This is one fantastic snacking apple. Golden Supreme: From what I understand (information is limited), the Golden Supreme is a fairly new variety of apple, grown from a lucky seed. The thin skin is pale yellow, with a very slight pink hue. The flesh is fairly crisp, and on the juicy side. It has a mellow flavor, with a slight white wine aftertaste. It’s not terribly sweet, with just a tiny hint of acidic tartness. Rhode Island Greening: One of the oldest cultivated apples in America, first documented in 1650. That’s just amazing. The Greening is, as you might have guessed, green- though it develops yellow undertones as it ripens. Its medium-thick flesh makes it a perfect cooking apple, which has been its historic use. Raw, the Rhode Island Greening’s soft (but not mealy) flesh has a pronounced tartness. Although the tartness isn’t overwhelming for hand snacking, it is probably best suited to cooking, juicing, and blending with other apples. 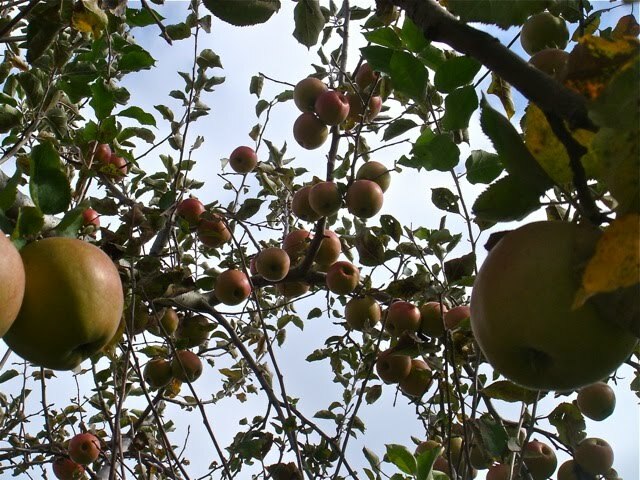 Margil: Another classic apple, the Margil is believed to have originated in England or France in the 1750s. It’s a small apple. The russet skin has green undertones, and is of medium thickness. The flesh is fairly delicate- soft and airy. Its flavor is on the tart side, but is balanced by an earthy flavor reminiscent of hazelnuts. Ida Red: Cultivated since the 1940s. The Ida Red lives up to its name- the thin skin is bright, brick red. The flesh is firm and fairly crisp, and keeps its texture for a long time in storage. The flavor is very well balanced- nice & sweet, with just enough tartness to keep it interesting. Perhaps not the most exciting apple, but certainly one of the best to snack on. Chestnut: A red/orange apple with very thin skin. It’s a crisp apple, with a bold sweet flavor. There is a hint of tartness at first bite, but after that, it’s all sweetness. Super sweet, actually. This would be a good apple for people who want to convince kids that fresh fruit is better than candy. Less successful for adults who already know that, and want something a little more complex. Northern Spy: Believed to have originated in New York in the early 1800s. The Northern Spy is a red & green apple with a thin skin. It’s very juicy, with a nice crisp bite. The apple is on the tart side, though there is a hint of sweetness. Probably better suited for cooking or as a highlight in a salad. Or, here’s a great idea- use a mix of Northern Spy and Chestnut in your juicer for a perfect apple juice blend! Macintosh: The Mac is one of the few heirloom varieties to remain popular through the ages- it’s been around since 1811. And there is a good reason for it- a fresh picked Macintosh apple is one of the most satisfying bites around. It’s has a perfectly balanced, prototypical apple flavor. Not too sweet, not too tart, just wonderful all around. The white flesh is soft and airy, a beautiful bite. However, the soft and airy flesh is also the apple’s Achilles’s heel- the poor Mac doesn’t store very well, before you know it, the poor thing has gone all mealy. If you’re lucky enough to find one fresh off the tree, grab it while you can. As you can see, there is more to the apple than “fuji” or “gala”. Take a trip sometime this autumn to the farmers’ market, and try something new. *Apples were grown by Red Jacket Orchard and Locust Grove Fruit Farm. *All apples were eaten raw. * I sourced the dates of earliest known production from Trees of Antiquity, Orange Pippin, and Apple Journal.